Latest post Tue, Sep 19 2017 1:56 AM by AsafBlasberg. 13 replies. What you want is to do a slip edit. Hold down the alt key and drag a lasso right-to left (so starting at the end point and ending at the clip start point). You'll now enter trim mode. Hover over the inside of the start or end points and drag. Actually, on closer inspection, you had already entered slip trim mode. I tried that but Avid did nothing. Am I doing something wrong? Also I don't want to slip, i want to trim both start and end points to the left or right, without affecting the sync. If I slip, it will cause it to go out of sync. A slip edit is what you use to not have things go out of sync. It trims the start and end points in place. I want to move the top of Cam 2 to the left and the tail of cam 2 to the left at teh SAME time without doing it twice. Here's a visual explanation of what I want to see in the timeline. So now that two edit points are selected, I Want to trim them left and right ,and doing this won't affect sync, this is what i need. Apparently I found a trick to make it work, very weird. If I have two add edits on the same clip, add transitions, then select the transitions and DELETE them, presto! 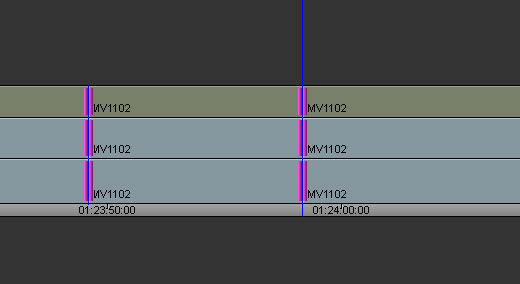 I now have two (2) vertical lines for two add edits and i can move them around the timeline. Is this by design? A bug?